A firefighter carrying out cleaning works following an accident involving an oil tanker . 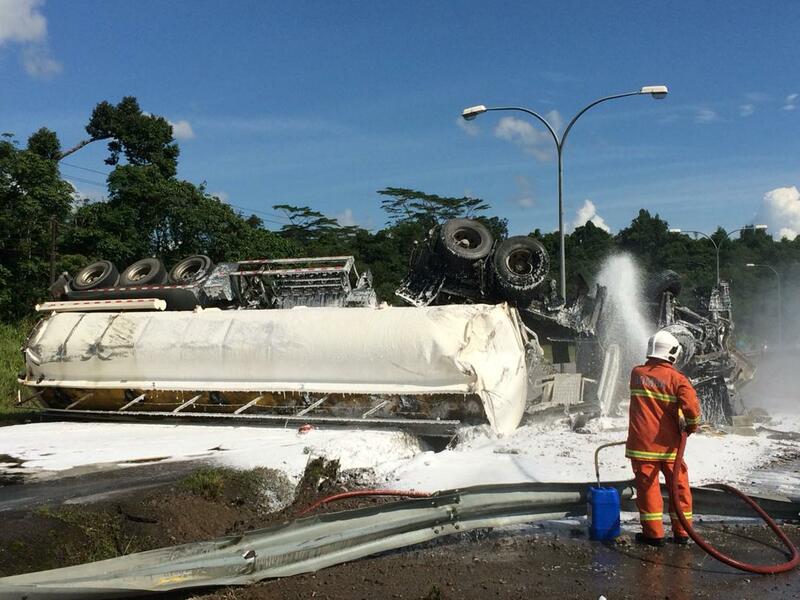 KUCHING: An accident involving an oil tanker has caused a temporary closure of the Kuching-Serian highway here today. According to the Fire and Rescue Department assistant operations director Tiong Ling Hii said in the 1.31pm incident, the tanker was involved in a single-vehicle accident rammed the road barrier nearby the Siburan fire station. Firefighters from the Siburan fire station were immediately deployed to scene. Tiong pointed out as of now, the route heading to Kuching from Serian have been reduced to one lane of traffic, while the route heading to Serian from Kuching is not accessible, for cleanup works.